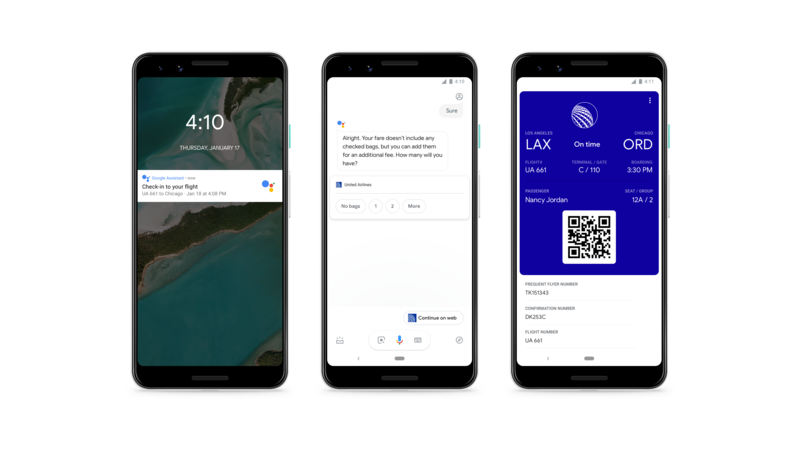 Starting in the next few days, the Google Assistant on Android and iOS will be able to check you in to your flights. For now, you’ll only be able to use this feature for domestic flights on United Airlines, though, but the promise is to expand this to other airlines over time. To give this a try, you just say “Hey Google, check in to my flight” and off you go, ready to enjoy your stroopwafel once you step on board. The Assistant will walk you through the check-in process, so it’s not all 100 percent automatic, but it still looks like a good user experience overall. If you’re all about being in control, changing your seats and checking the status of your upgrades, though, chances are you’ll still want to stick with the airline’s own app. In addition to now being able to check you in to your flights, the Assistant can now also book hotels for you. To do this, Google has partnered with Choice Hotels, AccorHotels, InterContinental Hotels Group, Priceline, Mirai and Travelclick. To do that, you already need to know where you want to stay and which hotel you want to book, so I’m never quite sure how useful a feature like this really is in day-to-day life. If you’re regularly staying at the same hotel on every trip, though, and maybe don’t care to shop around, then I guess this could save you a few clicks.